320 pages | 6 B/W Illus. Cyberbullying is one of the darker and more troubling aspects to the growing accessibility of new media technologies. Children in developed countries engage with cyberspace at younger and younger ages, and the use of the internet as a means to bully and harass has been greeted with alarm by educationalists, parents, the media, and governments. The definition and measurement of cyberbullying. The legal challenges in tackling cyberbullying across a number of international contexts. How the media frame and present the issue, and how that influences our understanding. 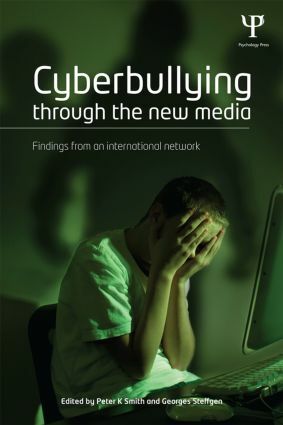 How victims can cope with the effects of cyberbullying, and the guidelines and advice provided in different countries. How cyber-bullying can continue from school into further education, and the strategies that can be used to prevent it. The book concludes with practical guidance to help confront the trauma that cyberbullying can cause. It will be a valuable resource for researchers, students, policy makers and administrators with an interest in how children and young people are rendered vulnerable to bullying and harassment through a variety of online channels. Peter K. Smith is Emeritus Professor of Psychology at the Unit for School and Family Studies at Goldsmiths College, University of London. He chaired COST Action IS0801 on Cyberbullying (2008-2012), and is currently PI of a European-Indian Network project on bullying, cyberbullying, and school safety and wellbeing (2012-2015). His research interests are in social development, school bullying, play and grandparenting. Georges Steffgen is a professor at the University of Luxembourg. He directs a research group on aggression – especially violence in school and cyberbullying – as well as approaches to health promotion. He has been project manager of national and international scientific projects on violence in school and anger. He authored and co-authored more than 40 papers in international journals and books, and he is editor or co-editor of 14 books. He co-chaired COST Action IS0801 on Cyberbullying.